I'm recently returned from my second trip to Sweden this year. Although I only spent 2.5 jam-packed days in Stockholm on my latest trip, I've been hoarding a few shopping tips since April. As you would expect from a major Scandinavian city, particularly one with a well-established reputation for style, the housewares shopping doesn't disappoint. But with Danish design dominating, as it does here, many of the items you encounter in Stockholm's design shops are in fact designed and produced by Sweden's neighbor to the Southwest. So in the spirit of localism, I've tried to constrain my recommendations to truly Swedish goods. 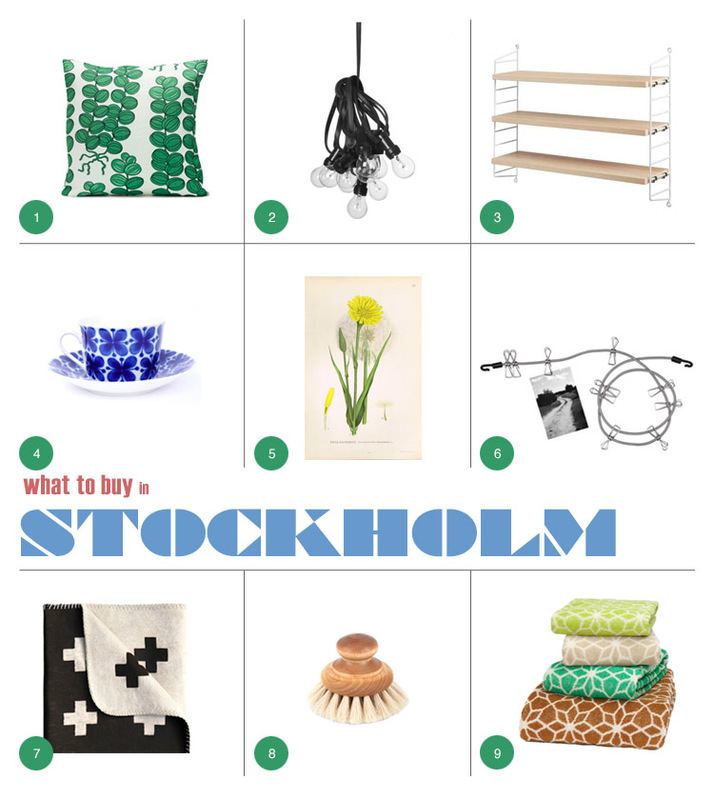 When you peer past the deluge of Normann Copenhagen wares on Stockholm shelves, there are quite a few local icons worth the allocation of space in your suitcase! 2. Loop 10 Bulb Lights, Granit | Designed for outdoor or indoor use, the Loop 10's are the best looking string lights on the market. Just don't forget the transformer— to use them back home, Americans will need an adapter that converts voltage from the European standard (220v) to the US (120v). Each bulb is 15w. 3. Pocket String Shelves by Nils Strinning | Designed in 1949, Nils Strinning's String system remains one of the most compelling modular shelving systems available today. Infinitely reconfigurable to accommodate books, knick-knacks, display pieces, kitchen wares, you-name-it, the proportions and wire bracket design give the sturdy shelves a feeling of lightness. Perusing images of string shelves is enough to get me pondering the logistics of relocating Stockholm. Because, sadly, they're still quite tricky and expensive to get ahold of in the U.S. The good news for Sweden-bound travelers is that, although his larger components are not easily transportable, the popular pocket shelf system is compact and suitcase-friendly. 4. Mon Amie Teacups by Marianne Westman, Rörstrand | Although Marianne Westman's Mon Amie china pattern is still in production today, it's the vintage sets you're after. I spotted a set of tea and coffee cups at Folk & Form (Gröndalsvägen 27) last week, although you can occasionally track them down stateside via Etsy or Ebay. Currently on this Etsy, this set of 4 teacups with saucers! 5. Vintage Flora and Fauna Lithographs, Antique Maps and Prints | My blogger pal Maren, of Bureau of Chic, tipped me off to an antique map shop in Gamla Stan, appropriately named Antique Maps & Prints (Köpmantorget 2). I was transfixed by the delicate and neatly stacked lithographs of birdlife native to Sweden. Vintage lithographs of swedish flora run about 10 SEK, while larger bird prints cost around 120 SEK each. 7. Cross Blanket by Pia Wallén, Asplund | The cross, a symbol of hope in Swedish folk art, serves as the inspiration for Pia Wallén's iconic blanket. In production since 1991, the reversible blanket is woven from 100% organic cotton grown in Peru. The Swedish original is newly available in the U.S. via Urban Outfitters. 8. Bath Brush with Knob, Iris Hantverk | Did you know that Stockholm is home to a brush manufacturing movement? Now you know! Iris Hantverk carries a range of exquisitely crafted brushes for bathing, kitchen and cleaning. My favorite model, with a sturdy top knob, is made from oiled-treated birch and horse hair, ideal for bathing because of the bristle's natural elastic properties. 9. Electricity Star Towel by Lisa Vilhelmson, Manos Design Shop | Manos Design Shop is a lovely shop in Södermalm for scouting out hand-crafted housewares. Inspired by cathedral windows, the 'Star' pattern is crafted from looped terry and available in a range of colors intended for mixing-and-matching. Like all Manos's goods, Vilhemson's collection is produced in small-scale batches.